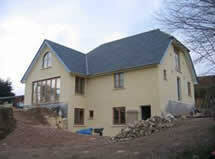 Polarwall offers a quick & effective construction with excellent structural and energy performance. 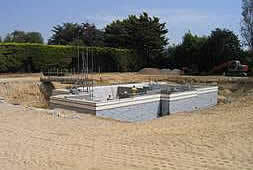 For too many years, builders and developers in Britain have avoided basement construction. The main reasons cited, are the cost of construction, and the cost of putting the basement right if it is built poorly and lets in moisture. However, in both continental Europe and North America, (both places where space is more readily available than the UK) they have been building basements as standard practice for years. It is time for UK builders to change their attitude to basements and here are some of the reasons why. As land costs increase it makes economic sense to optimise the available space, and with so many individual plots being infill and relatively small there is a definite need to maximise the living space. For example, if eight three bedroom houses with adjoining garages could fit onto a given piece of development land, how many plots could be fitted in if the garage was in the basement? It is probably ten houses, so there would be an immediate gain of two plots. Once you take away the cost of the footings, walls and roof for the above ground garages, and allow that sum against the cost of the basement construction, then the financial gain potential is obvious and significant. There is a further advantage for developers, which is that houses with basements sell for more money – people just love to have a basement! New basement technologies, such as Polarwall, have quickened the build time and reduced the cost of basement construction. One of the major costs of basement construction is the removal from site of the soil, and though this can sometimes be “lost” on larger sites, for compact sites it can be expensive. However, basements do not have to be fully immersed and basement construction that is partly below and above ground can save money and let in natural light. Sloping sites make for great basements, as one side can be opened to create a “walk out”, providing lots of natural light. A modern basement should always be dry. There are so many ways to keep the moisture out, (and we would always advocate a belt and braces approach). Damp basements should be a thing of the past. Warranty insurance is now available that will guarantee a dry basement from day one. Developers will have no more reason to fear the cost of putting a leaky basement right! Polarwall is ideal for any basement and retaining wall construction. The wall core can be 200mm, 250mm or 300mm depending upon the structural loading and the soil pressures. 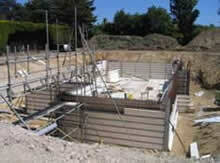 Wide formwork and low profile ties ensures excellent concrete compaction. We are able to offer both training to new contractors or provide contact to one of the Polarwall basement specialists in your area to assemble and construct your basement. Select the ideal product to compliment your development.